Now it's time to re-install the timing chain and cam sprockets. This is the make or break part of the job. If you mess up this part, you could seriously damage your engine! I spent a good hour on this making sure it was right. The Bentley goes into great detail on this, so be sure to check out that section! You first need to make sure the engine is at TDC (Top Dead Center) on cylinder #1. This should already be done before removal, so this should just be a double check. Cylinder #1 is the one closest to the firewall! You can feel for TDC by feeling the air through the spark plug hole. Once it's at the top, check the flywheel to make sure the flywheel mark is lined up with the timing line. If it's not you will have to turn the engine another 180 degrees. 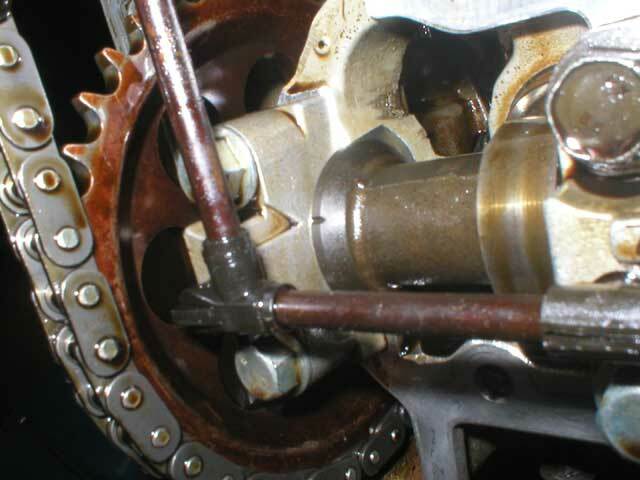 Get the chain as tight as possible from the tensioner end and slip the sprocket onto the chain. Once you get that sprocket on, the chain should just slide over the exhaust sprocket as the intake sprocket is holding the chain in place. Hand tighten both cam sprocket bolts and insert the timing chain tensioner. It's time to make sure the cam marks are lined up with the engine. I used a big screwdriver to turn the engine counter-clockwise a little bit at a time. DO NOT TURN THE ENGINE BY THE CAMS!!! The cam is not designed to turn the whole engine! I made sure the engine went through 2-4 full cycles and then rechecked the flywheel timing mark and the cam marks. My cams were off about 0.5 mm, but both cams were the same so I figured it was okay. Now you can tighten down the cam sprocket bolts to 47 ft/lbs. The hard part is done! It's time for a beer break.